The Pyle Portable PA Speaker System combines high-powered audio and Bluetooth wireless music streaming ability. Enjoy portable and wire-free sound from all of today’s latest wireless devices (like Smartphones, Tablets, Laptops, Computers, etc.). The included handheld microphone, and the system’s unique microphone talk-over function, allow you to create an instant Karaoke party -- it also works great for public gatherings and crowd control. Additional system features include built-in rechargeable battery, FM radio, audio recording ability, microphone input, USB flash and micro SD memory card readers, along with an Aux (3.5mm) jack -- so you can connect and stream audio from even more external devices. 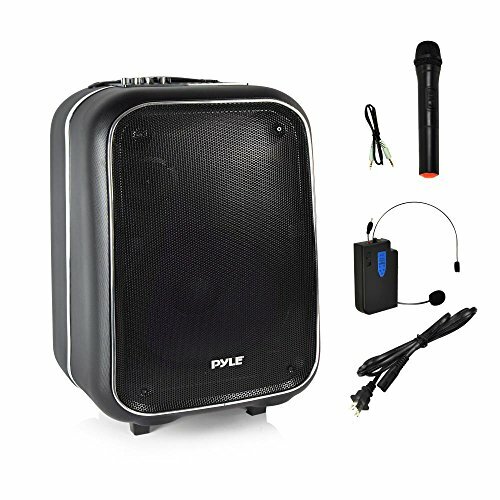 Take control of the sound, and the crowd, with the Pyle Bluetooth PA Loudspeaker System.